Houston is a wonderful city for many reasons. Unfortunately those reasons do not include awesome fossil hunting spots. I suppose it’s a small price to pay for the great food, amazing academic institutions and a cool music scene we have access to every day in the Bayou City. But still, nothing beats the thrill of unearthing a remnant of a bygone age that hasn’t seen the light of day in millions of years. Luckily, for those of us who yearn for that experience, there is hope. There are actually several places in Texas, some surprisingly close, where you can find TONS of fossils and in today’s edition of Beyond Bones I’m going to tell you about some of them. Image Courtesy of Texas Beyond History. This is probably the best trip on the list because it combines a fossil hunt with a trip to the beach! The small town of High Island lies about an hour and a half southeast of Houston. 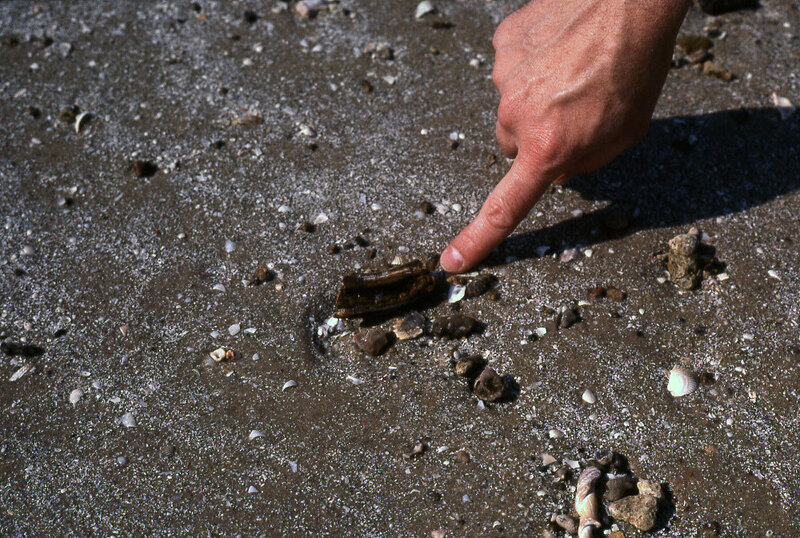 Fossils ranging in age from 28,000 to 135,000 years old regularly wash up on the beach just outside of town. These fossils date to long after the dinosaurs went extinct, but that doesn’t mean you won’t find the remains of cool creatures. Fossilized bones belonging to giant ground sloths, camels and even giant armadillos have been found washed up on the beach after storms. You can also find ancient human artifacts, such as Clovis Points, one of the oldest types of stone tools found in the Americas. The only catch is that the fossils and artifacts are distributed sparsely along the shoreline, so it’s not guaranteed you’ll find anything. The amount of stuff that washes up depends on the weather. The best time to go is after storms, because the action of the waves dredges up bones and artifacts from the bottom of the gulf. If you’re wondering how all this stuff ended up beneath the Gulf of Mexico, it’s because sea levels were much lower during the last Ice Age. During that period, much of Earth’s water was lock up in the giant glaciers that covered vast tracts of the Northern Hemisphere. The coast of present day Texas was about fifty miles further out than it is now. Whisky Bridge Crosses the Brazos River on State Highway 21, east of College Station. The unusual name dates back to the era when Brazos County was dry. 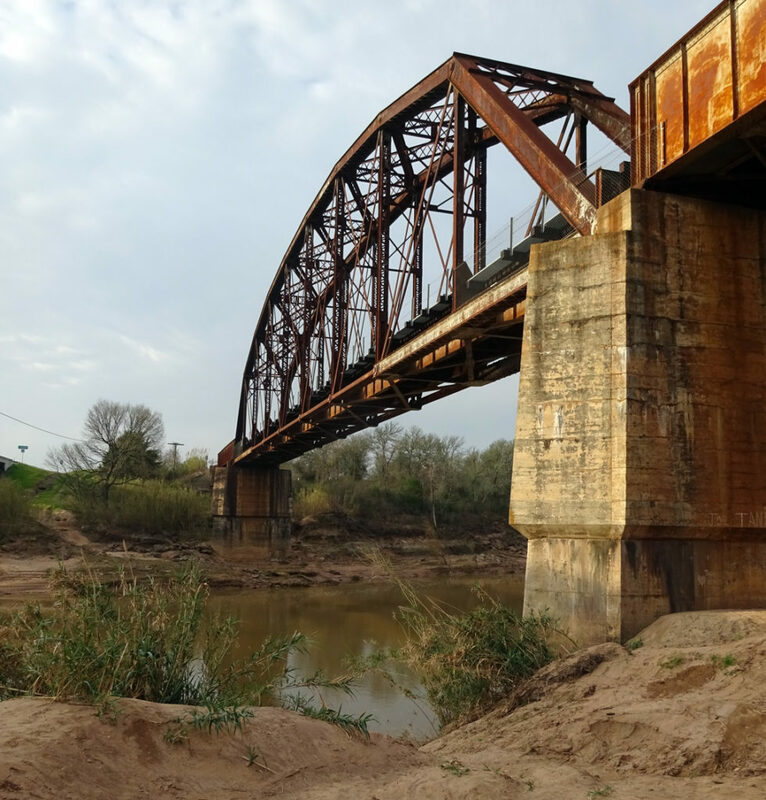 Whiskey bridge was the closest crossing into “wet” Burleson county to Texas A&M. Some enterprising spirit set up a liquor store just on the other side of the bridge, waiting to “refresh” thirsty Aggies. The river banks below the bridge have earned the reputation of being the most fossiliferous site in Texas. The strata exposed by the erosive action of the river are of Eocene age, about 35 million years old. At that time most of Southeast Texas was under a shallow sea, so fossilized corals, sharks teeth, clams and sea snails can be found. If you go to Whiskey Bridge, you are guaranteed to find fossils. The site is on public land, so it’s okay to keep what you find. There’s a little gravel area on the side of the highway where you can park, and then all you have to do is make your way down to the river’s edge. Accessing the site can be difficult depending on weather conditions. If there’s been a lot of rain, the banks can get muddy and steep. Even in the best conditions prepare to get muddy. It’s probably not the best place to bring small kids. However, for older kids and adults, it’s generally perfectly fine. Garner State Park is a fun fossil hunting option because, like High Island, there’s other stuff to do too. But there’s one catch when it comes to Garner: YOU MAY NOT KEEP THE FOSSILS YOU FIND. Because Garner is a State Park, not public land, it is not okay to remove anything you find there. That being said, there are fossils to be found and if you’re looking to just enjoy the search and have a good time, Garner’s a great place to fossil hunt. Probably the best place to look is on the Old Baldy trail. As you ascend the hill, you pass layers of limestone laid down during the Cretaceous epoch, which lasted from 135 million to 63 million years ago. Limestone forms in shallow sea environments so the fossils you’re likely to find include ancient sea snails and coral. Image Courtesy of Mineral Wells Fossil Park. This place is located about 5 hours from Houston, so maybe it’s a stretch to call it a day trip, but it’s just such a great spot to fossil hunt I couldn’t keep myself from adding it to the list. Mineral Wells is a quiet little town about an hour west of Ft. Worth. It gets its name from the nearby mineral springs that were a popular attraction for health enthusiasts in the early 20th century. Just outside of town is Mineral Wells Fossil Park. Admission is free and you’re allowed to keep whatever you find. The fossils found there date to the Pennsylvanian epoch, a little more than 300 million years ago. You will definitely find fossils there, the only question is what the size and quality it will be. The fossils erode from the walls of a large pit, so going after rainfall is best, just give the soil time to dry or else you’ll find yourself in a giant mud bath. The park has an interesting history. Originally the town’s dump was located there, but in the 1990’s the dump was closed and all the waste and containment walls were removed, leaving behind an open pit. Within a few years locals started noticing fossils eroding out of the walls of the pit, and the park was born. This is probably the best spot on the list because it’s safe for the whole family to go and you will definitely find lots of fossils, including crinoid stems, and bivalves. 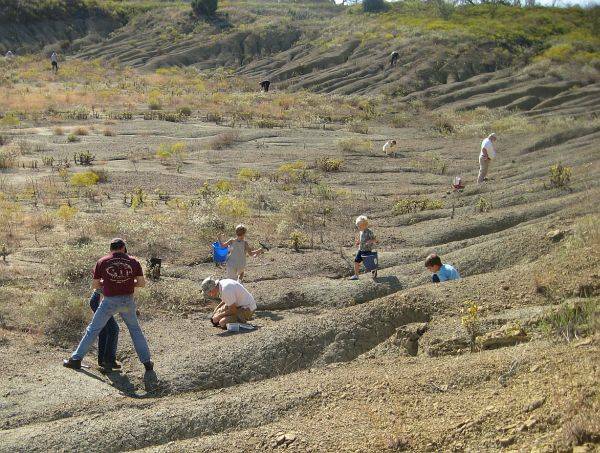 Located about an hour southwest of Ft. Worth, Dinosaur Valley State park holds lots of fossil hunting possibilities. Once again, since it’s a state park, YOU MAY NOT KEEP ANY FOSSILS YOU FIND. However, the stuff you can see is just so cool that I couldn’t fail to mention it on this list. You can actually find dinosaur footprints there! The footprints belong to a few different dinosaurs, including Texas’ state dinosaur, Paluxysaurus and also Acrocanthesaurus, a vicious, predatory giant. Some of the footprints are 36 inches in length! You can also find fossil bones around the park. But once again you may not keep what you find. These fossils date to the Cretaceous epoch, around 113 million years ago. At that time the area was at the edge of an ancient sea, so the types of fossils you may find range from sea life to possibly even dinosaur bones. I hope you enjoyed this little list of fossil hunting day trip options near Houston. If you know of any cool spots I missed, let me know in the comments! Also, if you’re interested in booking a private trip to any of these location, guided by one of our staff, you can get information on that HERE. And for all you fossil lovers out there, don’t forget to visit the Hall of Paleontology, here at the Houston Museum of Natural Science. It may not be as fun as digging, but you’re bound to discover skeletons of ancient creatures you’ve never heard of as you tour the hall, so the thrill of finding something new is still there. And for those of you who have visited before, we regularly add new specimens to the hall, so there’s still plenty waiting for you to discover. Dead Things That Might Be Under Your House! Why I’m Glad Chivalry Is Dead! Thanks for this post! Once we find fossil bones at the beach, where would you recommend we go to find out what creature they used to belong to? Texas City Dike has some pleistocene fossils as does the area under the IH 10 bridge over the Brazos River. And, check out the Native American midden area at Pine Gully Park, on Galveston Bay. I used to take HMNS students out there on Coastal Ecology field trips, back in the 70s.